My husband signed me up for the Tough Mudder event this year…well, he signed us both up last year, about 4 months in advance.We trained, (I mean we weren’t jumping into ice water on a weekly basis in order to get our bodies acclimated to hypothermia, or hauling tree stumps up our unbelievably steep driveway, nor did we hang out in disgusting slushy mud pits to become comfortable with them, or electrically shock ourselves every morning to get out of bed, we weren’t climbing over walls twice our height, or inhaling smoke from burning hay stacks to prep our lungs) sort of. We mainly just did a lot of running, it was 12 miles after all. On race day (not that it was a race) I was very impressed with the pep talk and the emphasis on teamwork, it really gave this event an entirely different feel. I knew that we’d be getting dirty and that we would be exposed to freezing water but never did I think it would be as bad as it was. Jumping into ice water in the middle of February on a windy day with temperatures in the mid 40s is simply irresponsible. But it was done, and even though I was sad about losing my orange hat, with a ponytail hole, in the water, nothing would have convinced me to get back in to get it. From the two mile mark, the ice bath, until about mile 8 my feet were completely numb from the cold, I couldn’t feel a thing and am convinced I probably rolled each ankle several times.As my feet thawed around mile 8 I realized there was a little stone in the bridge of my foot for who knows how long rubbing away at what was now an unbearably painful blister in the arch of my right foot. I was able to somewhat ignore it for about two miles, running asymmetrically on the outside of my right foot until the blister ruptured. I knew exactly when it ruptured because I happened to be walking across some disgusting knee deep mud at around mile 11 when I experienced the worse burning sensation imaginable in the arch of my right foot. Thank God Jerry was there next to me because for the remainder of the run I had to hold on to him in order not to put my full weight on the right foot. The 12 miles ended with electroshock therapy, I, being too cold and exhausted to risk being struck down, strategically maneuvered my way across this last obstacle unharmed. That said, I did get struck pretty bad in an earlier electroshock therapy session. Even blister aside, the last couple of miles were very tough since the wind picked up and even running couldn’t warm you up. After crossing that finish line I couldn’t find an answer to “Why the hell did I do THAT!?”. It was only several days later that I caught myself thinking intently about what I will do differently/better next year. Yes, that is how these things work, don’t ask me why, I certainly don’t have an answer to it either. 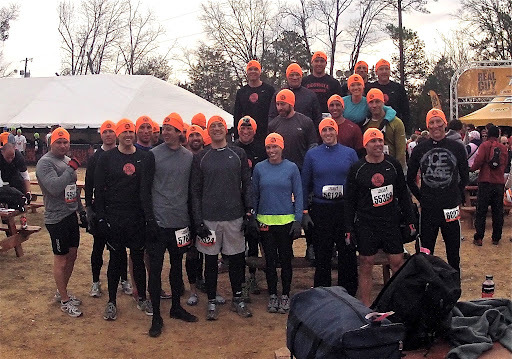 Here is a link to the GA 2012 Tough Mudder video. You guys are crazy and awesome all at the same time. I'm not surprised that you've already started thinking of how to do things differently next year. Good job. Heal up quickly. Oh my Goodness! I had no idea it was that insane. WOW, you are definitely a strong chick to pull through all that. Keep it UP. This entry was posted on February 22, 2012 by natalyaperullo in Misc..